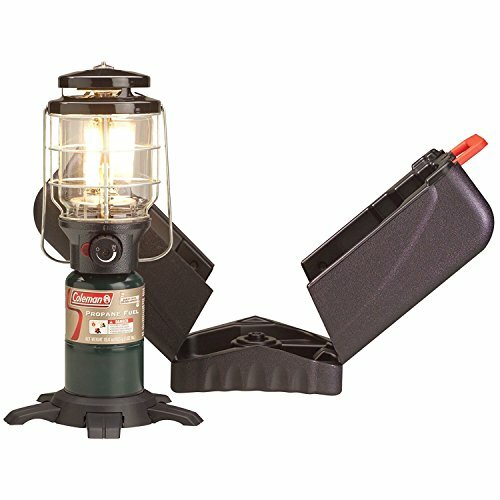 Take an ultra-bright lantern with you next time you experience the outdoors with a Coleman Northstar Propane Lantern with Case. The tube-mantle design of this lantern shines brighter than most standard 2-mantle lanterns - up to 1500 lumens of light that reaches up to 26 meters away. Starting your lantern is easy. Just hit the Instastart push-button ignition and dial in the perfect brightness with the adjustable control knob. Once your lantern is lit, the footed base provides stability when placed on a table, and the bail handle allows for easy hanging. Meanwhile, the globe guard helps protect the globe from breaking. No matter where you go, the PerfectFlow pressure control technology produces a steady fuel stream and consistent performance in all kinds of weather. When you're ready to head home, the feet on the base collapse for more compact storage in the included case until you're ready for your next bright adventure.